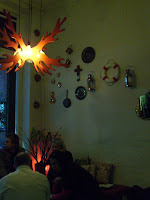 Bar Lourinha isn't a big space, yet for its narrowness it can squeeze in a lot of lively patrons on a Thursday night. The kitchen takes up almost as space as the dining/drinking area. 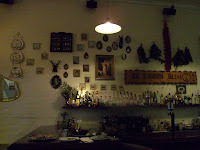 It's a valid split, since this bar takes its unmistakably Spanish- and Portuguese-influenced food very seriously. What open space there is has been designed and decorated effectivelyto ensure a convivial drinking setting, with low lounges in the front window and bar and bench seating. The menu here is not tapas - serving sizes go beyond what one would cover the top of a glass with. In fact, both pricing and serving size sit somewhere between snack and main meal. Most dishes are $12-17, (the specials were a little pricier), and while our chosen two looked a little on the small side I left full enough to last through 'Hamlet' without craving a snack. 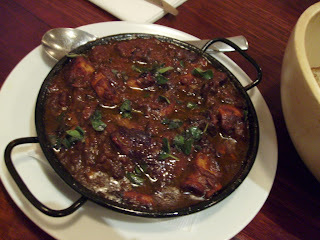 Octopus stifado takes its inspiration from the other side of the Mediterranean, a Greek cooking method involving slow stweing in a tomato sauce, usually with garlic and cinnamon. The sweet spice in this case, however, was allspice berry: tiny caviar-like spheres. A much stronger flavour came from the thyme that had rested with the tomato and adorned the dish. This wasn't baby octopus , but instead the 'big' variety, as the waitress put it. Despite imagining a serving plate the length of our shared bench table, our allotted portions of the eight-legged creature fitted into a modest bowl. Octopus is a bit challenging: it not only easily turns tough if not handled correctly, but the suckers and head cavity present quite different textures. Here they had managed it quite well - the suckers had that lovely, slightly resistant feel of squid, whereas the head was closer to the texture of a long-stewed meat like rabbit. The stew was well-balanced too between tomato sweetness and inevitable saltiness from the aquatic animal. 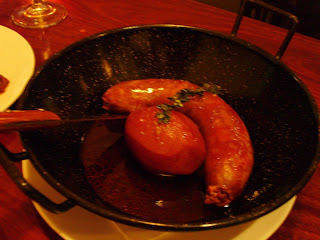 The second dish was the housemade chorizo, with red wine and nicola potatoes. As you'll see from the pic, 'potatoes' was a little generous! The chorizo was softer and moister than what one normally picks up from the deli. Underneath its taut skin the meat fell away in little pieces like a meatball might. It had the unmistakable cured flavour of the Spanish sausage, however, and plenty of garlic had stuck through the curing process. The bread that accompanied the meal came in a smoothly turned wooden bowl, and could only be described as a hunk: a big wodge of sourdough for us to tear and share between us. It served well for mopping up the oily, salty cooking juice that accompanied the chorizo. Nice review, but the description of 'potatoes' is pretty bloody cheeky on their part! At least the chorizo was good. I'm with you on Bar Lourinha's potatoes call! I agreed with everything in The Age's review of 'Hamlet'. I enjoyed the production - the music from Sarah Blasko, Barry Otto as Polonius, and Gertrude (actor's name escapes me) were my highlights - but Brendan Cowell simply did not get it. He seemed extremely conscious of the fact he was on stage, rather than in front of a camera - lots of running about and over-gesticulating. It's a fairly long production too: about three and a half hours with interval. I think it's worth seeing if, as in my case, it's a text you particularly enjoy analysing, but there have been, and will be, better productions. Hopefully Cowell will improve as the season goes on.